A river of burnt umber flows every year from southern Canada through the U.S. to the oyamel fir forests in the mountains west of Mexico City. This river tumbles along in a kind of bubbly joy reserved for kids, fairies, hermits, counterfeit curmudgeons and anyone whose soul is pricked by unimaginable beauty not trying to be beautiful – simply being. This river, the flow of monarch butterflies as they leave North America for their wintering grounds in Mexico has been flowing for millions of years and represents the constant ebb and flow and migrational (seasonal) pattern of life that Homo sapiens find themselves more and more disenfranchised from as we become more and more sedentary. And as we become more and more sedentary it becomes easier for us to turn our heads from this beautiful, magical and mysterious river that washes over us, the way we turned our heads from Carolina parakeets and passenger pigeons, the eastern elk and the southern Rocky Mountains wolf among others. 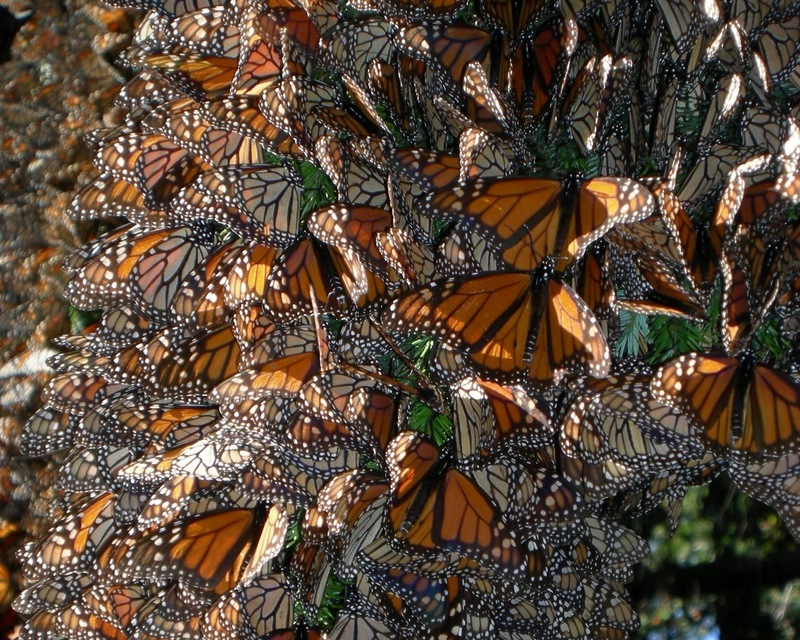 This year’s overwintering population of monarch butterflies in Mexico is estimated at about 33 million individuals about half of 2012’s estimated 60 million, which was the lowest number ever recorded in the 30 or so years since records have been kept. Of course, every year, there are variations in food supply, weather, predation, etc. that can account for fluctuating numbers. But this steady decline points to something more established than weather patterns and/or increased or decreased predation. 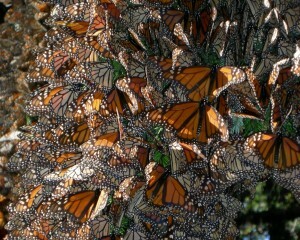 More and more fingers point to the eradication of the monarch’s host plant – milkweed, especially in the Corn Belt. According to a recent New York Times article, “Monarchs lay their eggs only on milkweed, and patches of the plant have rapidly disappeared from the Great Plains over the last decade. As corn prices have risen — spurred in part by a government mandate to add ethanol to gasoline — farmers have planted tens of millions of acres of idle land along the monarchs’ path that once provided both milkweed and nectar. World Wildlife Fund points to one major culprit – Monsanto. WWF points to the use of Monsanto’s herbicide Roundup. One report states that major corn producer and once major monarch butterfly host, Iowa, has lost 98 percent of it’s milkweed – the plant host (and the only plant where monarchs lay their eggs) of the monarch butterfly. So while we fiddle with futures and commodities profits and increasing farm production Home continues to burn. The passenger pigeon, Carolina parakeet, Rocky Mountain wolf and other canaries in Coal Mine Earth continue to perish while we turn our heads.